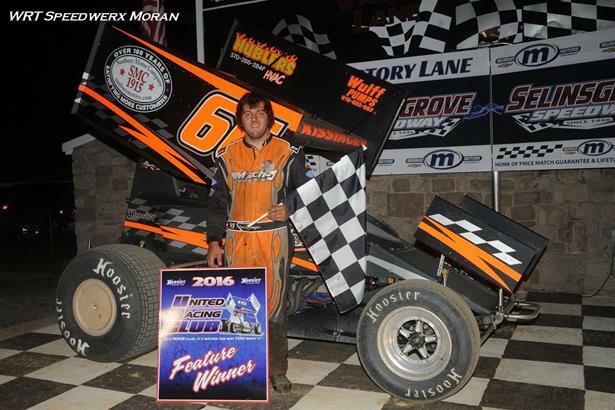 Ryan Kissinger came from his 7th starting position to claim his first sprint car race of the season Saturday night at the Selinsgrove Speedway. With rain prediction throughout the night Selinsgrove Speedway rolled the dice and beat mother nature. With surrounding tracks canceling, Selinsgrove decided to roll the dice and continue with the show. Saturday night was United Racing Club's 4th visit to the 1/2 mile facility and with 22 cars signed into the pit area, 3 heat races were needed. Heat race wins went to 2014 URC Champion and current point leader Davie Franek in his Franek Auto Sales #28. Heat race #2 was won by 9 time URC Champion Curt Michael aboard the Bill Gallagher owned GEI Enterprises, Valley Forge Inc #5g and heat race #3 was won by 2016 3 time URC winner Mark Smith in the Mach 1 Chassis #1m. After heat race winner #1 Davie Franek pulled the #3 pill, the front row was comprised of 9 time URC Champion Curt Michael and Mark Smith. At the drop of the green flag Curt Michael jumped out a the lead, but with Mark Smith close in tow, Smith quickly passed Michael into turn 1 of lap #2. Smith continued to lead and was into lapped traffic by the 5th lap. By lap 10 Smith was battling heavy lapped traffic with Curt Michael, Jason Shultz, Robbie Stillwaggon and Eric Tomecek completing the top 10. A lap 16 red flag collected the top 3 cars, when Smith and a lapped car made contact, second place Curt Michael and 3rd place Jason Shultz had no where to go and were also collected in the wreck. With the top 3 unable to continue, Robbie Stillwaggon in the Quality Auto Body #89 was shown as the leader with TJ Stutts 2nd, Eric Tomecek 3rd and the 66 Ryan Kissinger who was the fastest car on the track. At the restart Stillwaggon jumped out to the lead, but Stutts took command from Stillwaggon on lap 20, who was now feeling pressure from the 3rd place running Kissinger. After a lap 21 spin by the 71 car of Charlie Anderson, the race leader TJ Stutts selected the bottom with Stillwaggon on the outside. Hard charging Kissinger was now 3rd. At the drop of the green, Stutts jumped out to the lead followed by Kissinger. Coming down the front stretch with the 2 to go in the flaggers hands, Kissinger made his move going into turn one taking the lead from Stutts. Kissinger went unchallenged for the remaining laps and parked the Sunbury Motor Company, DMY Performance #66 in victory lane.